Vitamins and Minerals are required for good health. 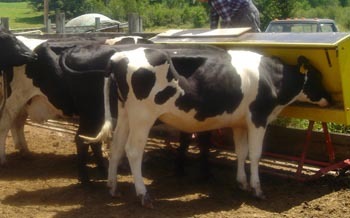 Having many different minerals in the feeder allows the cattle to choose from the various minerals to maintain health. Note that consumption of minerals varies from farm to farm. Your animals may eat more or less than average, depending on their needs. The 12-mineral starter or maintenance kit includes one 25 lb bag of each of our 12 Free Choice Minerals. The 15-mineral starter or maintenance kit includes one starter bag of each of our Free Choice Minerals, along with MOP, Redmond Salt, and Free Choice G.R.P. The 40 Bag Free Choice Mineral Kit contains 40 x 25 lb bags of our 12 Free Choice Minerals. Recommended for 250 Head of Dairy or Beef Cattle, based on average usage. The 80 Bag Free Choice Mineral Kit contains 80 x 25 lb bags of our 12 Free Choice Minerals. Recommended for 500 Head of Dairy or Beef Cattle, based on average usage.